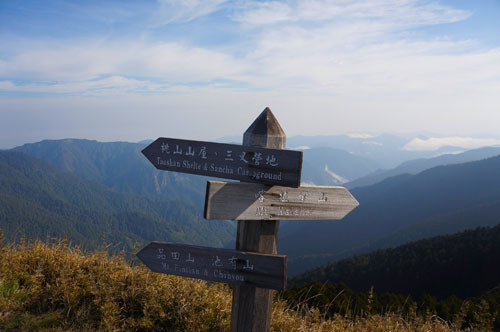 Taiwan WuLing Sixiu (武陵四秀) refers to four mountains located on the eastern ridge of Snow Mountain range. From west to east, they are Pin Tian Shan (品田山 3524M), Chi You Shan (池有山3303M), Tao Shan (桃山 3325M), Ke La Ye Shan (客拉業山 3133M).They span about 10KM in distance. 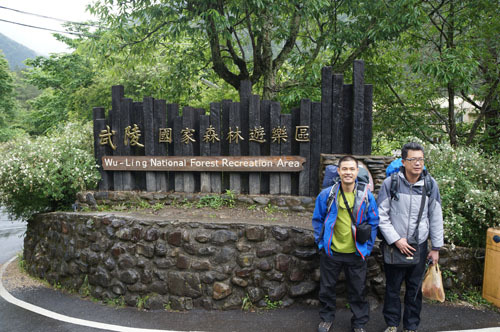 The typical starting point for hiking is WuLing Farm, that people often dub those 4 mountains as WuLing SiXiu (= 4 beauties). We hired local tour guide to bring us to Sixiu. We spent 2 nights on ridges staying in mountain huts. 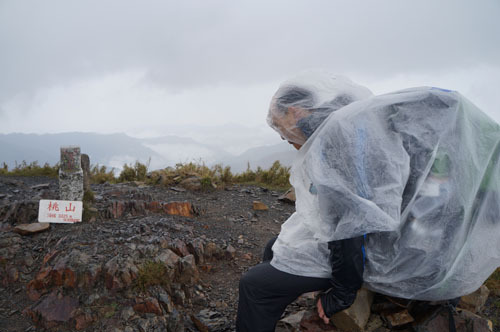 Unfortunately, most of the time we were accompanied by rain, sometimes quite heavy. 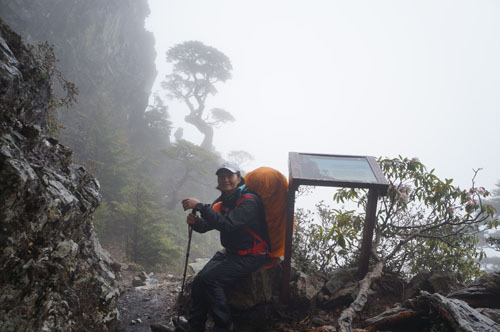 Paths became super slippery, views were hidden by mist by large. In addition to 13kg~15kg back pack and mild altitude sickness. The journey was quite a demanding one. This is the starting point. We started walking from here. There is a tourist centre which has toilets and a small shop. 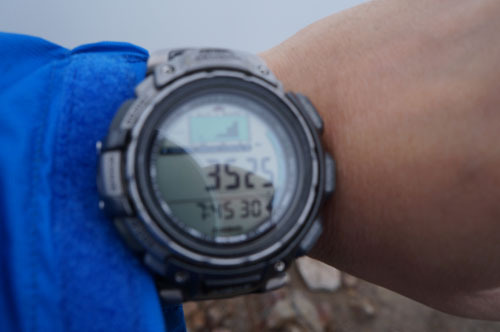 Our starting altitude was about 1800M (Point A). We left the cemented pavement and getting to the footpath. 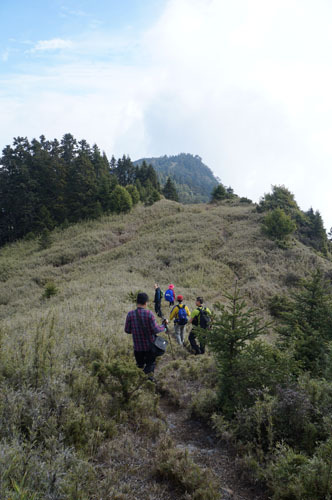 We took the footpath that led us to Tao Shan. 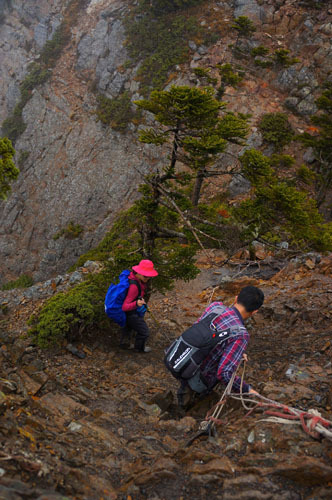 We need to hike from 1800M (Point A) to 3325M (Point B) with 15kg of load on our back. 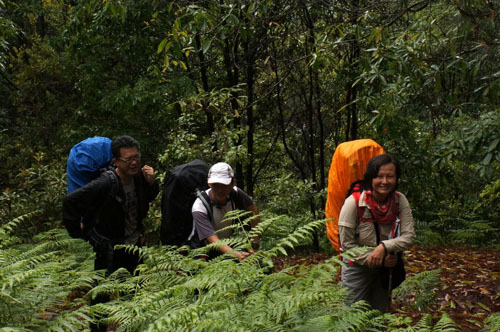 It started raining as soon as we started hiking on the footpath. In the begining, the rain was mild. 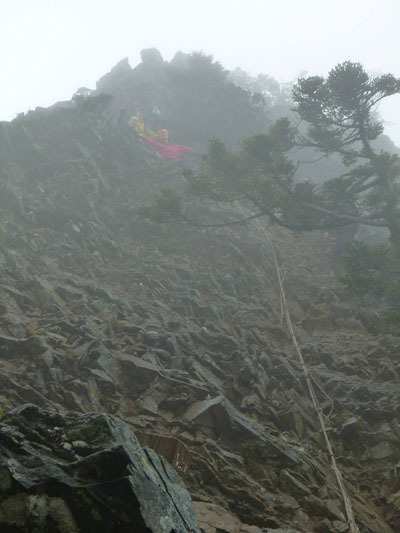 As we go higher, it got steeper, and the rain got heavier. The footpath somehow turned into a small creek. We were like trekking along a stream. Some of our waterproof gear started to fail under consisent heavy rain. 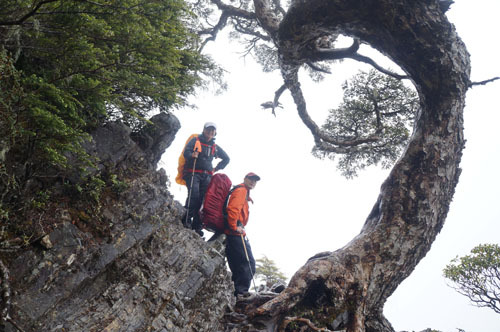 In the presence of strong wind, we were fighting against exhaustion, thin air and hypothermia. Our extremities (e.g. fingers) were freezing. We were demotivated to take pictures under such an environment. 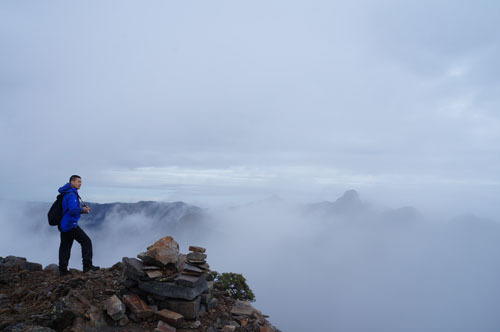 Finally, we arrived at the top of Tao Shan (Point B). The rain eased a bit when we reached there. My fingers are so cold that I could hardly operate the camera. A pair of waterproof gloves are really needed. 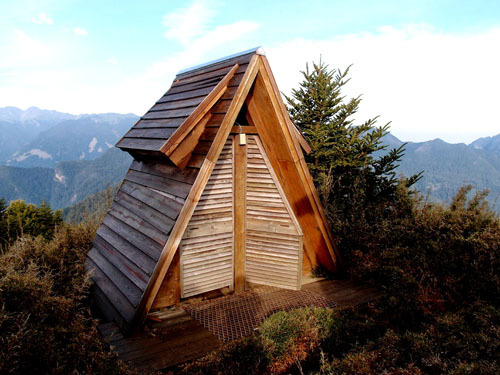 The mountain hut (Point E) can roughly accommodate 30 people. It has a ground floor and a upper deck. I must say the ventilation was pretty bad, it can be smelly and stuffy when it is packed with hikers. When it rains, there is mild water leak. We slept, cooked and ate on the upper deck. There is one lamp for the upper deck which will be turned off at 8pm. Sort of inconvenient. There is a water tank and a toilet outside the hut. The toilet is kind of close to the hut, there is muddy path connecting both. When you are sleeping in the hut, you can smell the toilet. Wow, sunshine in the morning. That's the appearance of the mountain hut (Point E). The sky cleared up. It is 大小霸尖山. We go back to Point B (桃山), on the way to Point D (客拉業山). Leaving Tao Shan to Ke La Ye Shan. Although the weather looked very good, the path was still very slippery. Very soon we hiked inside a forest. 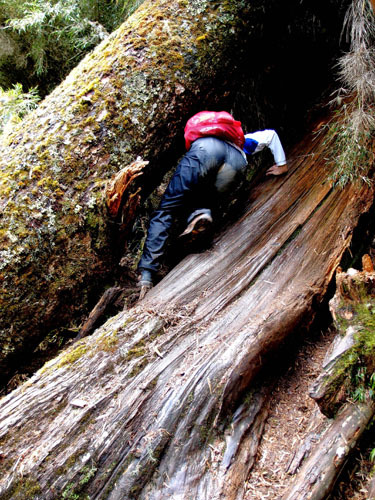 There are many fallen trees, I mean really big trees. Sometimes we have to squeeze through the tree gaps. Fat guys won't make it. This is Point C (詩崙山) which is not a high point with scenery outlook. We were getting close to Point D (客拉業山). 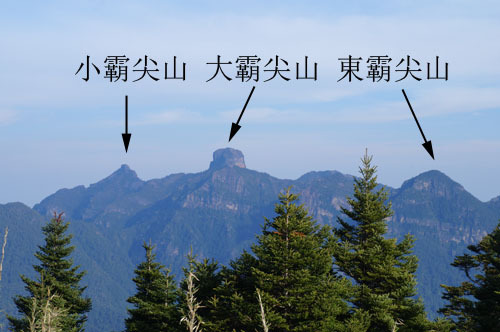 This is Point D (客拉業山), one of the Sixiu. A kind of messy. There were some debris of some kind. Since this hill is not particularly interesting so we traced our route back soon after taking group photo. 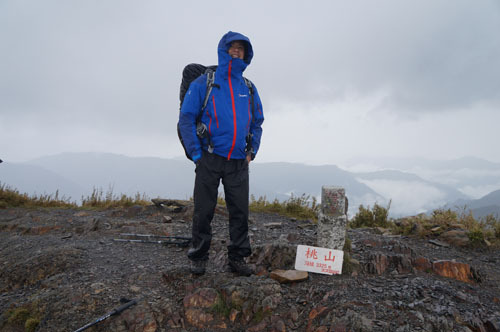 On the way to Point G (新達山屋, Xinda Mountain Hut), the sky turned misty with showers. There are quite a bit of up/down climbing between Point E and Point G. I would rate this section as 3 stars. 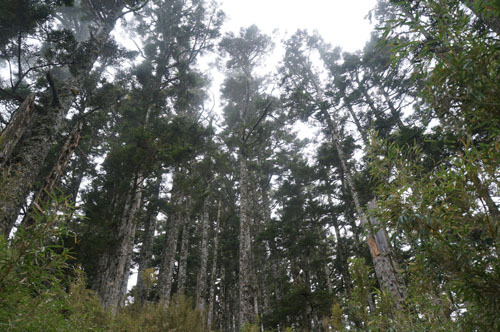 Although Point F (池有山, Chiyou Shan) is sort of on the way to Point G (新達山屋, Xinda Mountain Hut), we did not visit this Chiyou Shan because we were a bit in a hurry. This Chiyou Shan is only 300M away from the main footpath. Strong man overcoming a rock wall. A beautiful tree veiled in mist. 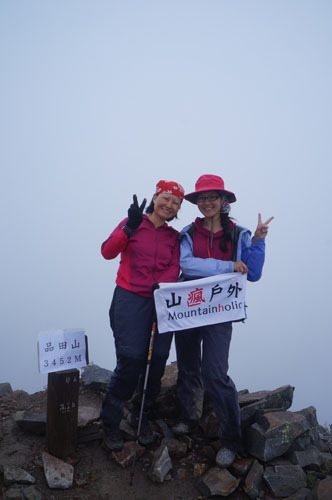 Finally we arrived at Point G (新達山屋, Xinda Mountain Hut) whose construction is similar to Taoshan Mountain Hut. It is indeed sightly bigger. 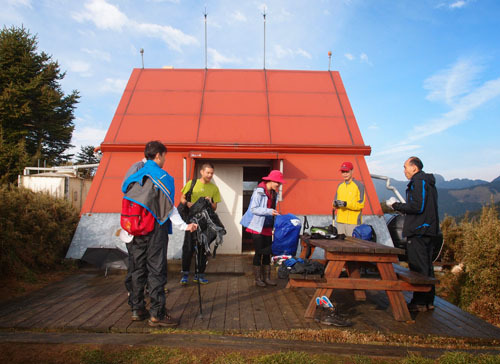 However, we had a full house in Xinda Mountain Hut, there were 30+ wet hikers staying in. 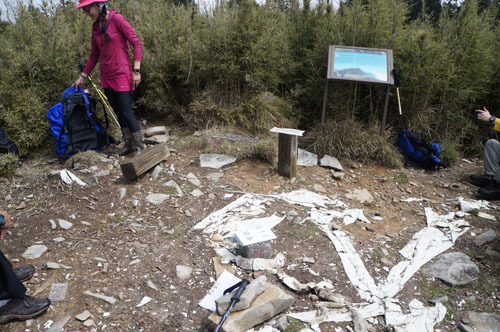 The general condition was worse than Taoshan Mountain Hut. There was no light in the deck where we slept. We have to operate with head lamps. With the door closed, there was almost no air ventilation. In conjunction to the fact that there were 30+ pairs of wet muddy hiking boots and other hiking gears inside the hut, it smells disgusting and it was suffocating. At one point, I was thinking whether we would choke to death. Although I have not been to any concentration camp, I guessed our experience in Xinda Mountain Hut would be a very good reference. 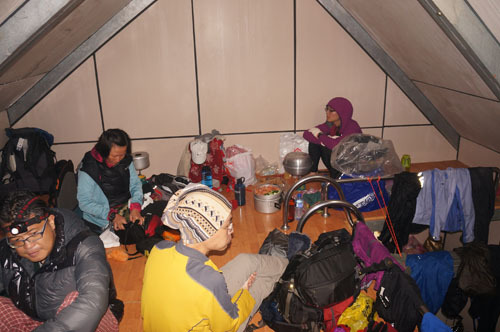 Given the conditions in both mountain huts, we have only slept for 3~4 hours per night on average. 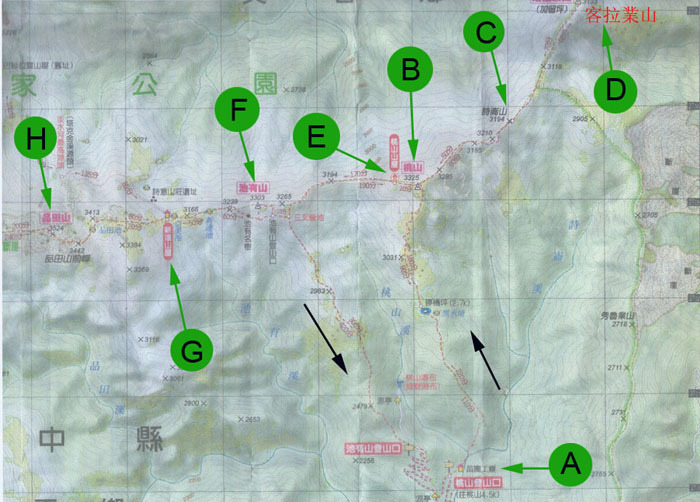 Woke up early in the morning, we set off to Point H (品田山, Pintian Shan) in light back pack. We are going to visit a V-shape gorge right before Pintian Shan. The gorge have 15~20M in depth. Inclination is about 70~80 degree. 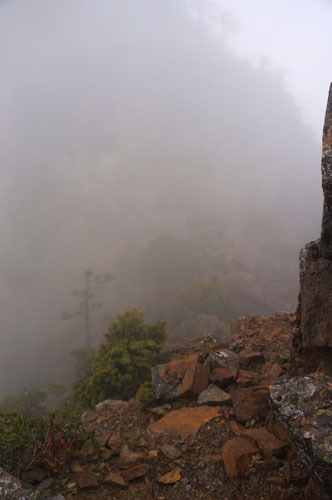 The thick mist covered the true grandness of the gorge. The downward path is very rocky with many firm foot holes and hand holes. 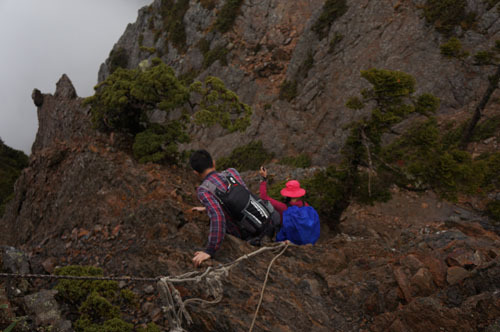 One with moderate climbing experience should be able to handle it with ease. 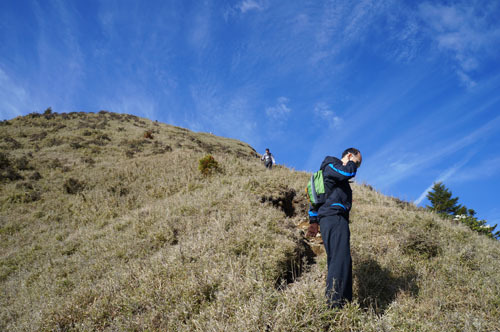 After reaching the trough, we have to climb steep slope again. The climb is quite challenging because there are many loose rocks and sand. 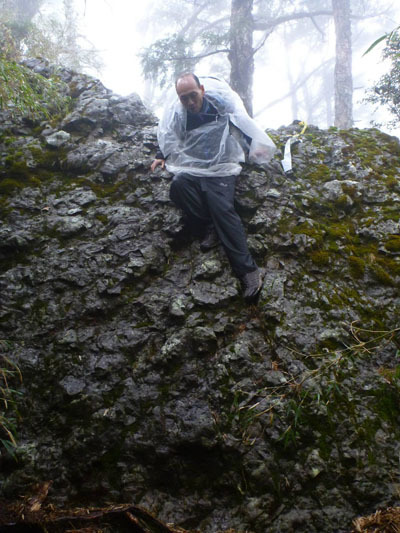 We have to be careful not to trigger any falling rocks. After scaling up the V-shaped gorge, we arrived at the highest point of this trip. 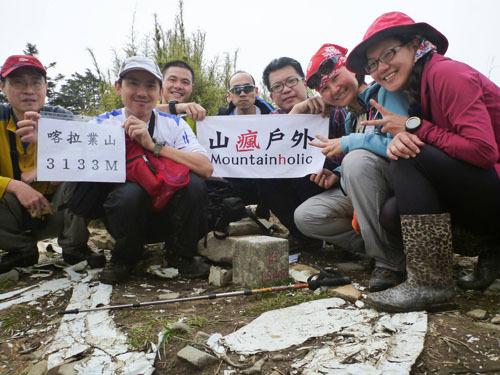 You see we arrived at the peak of Point H (品田山, Pintian Shan) at 7:45am! So early. 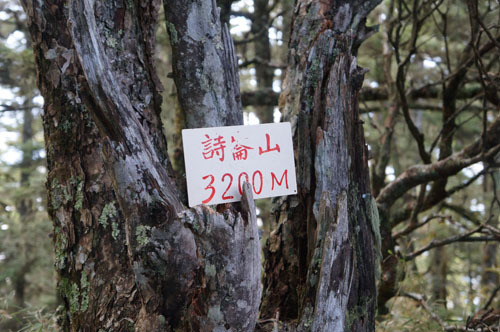 The altitude displayed on the sign is wrong, it should be 3524M. Sorry, the background was milky white. What a view! Man in the Mist. 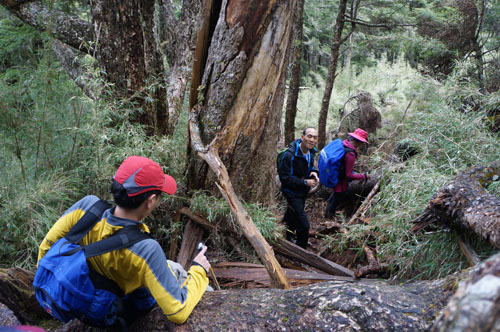 After visiting Pintian Shan (品田山), we returned to Xinda Mountain Hut (Point G), get our backpack and start our return hike. 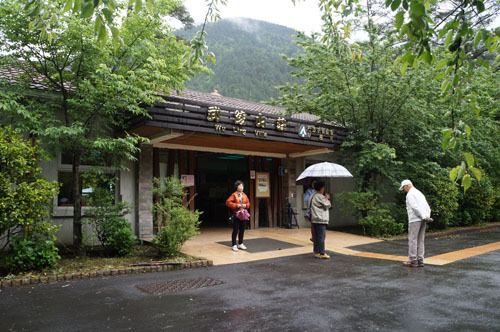 The original plan was to visit Point F (池有山, Chiyou Shan) but it rained quite heavily when we arrived at the entrance of Chiyou Shan (池有山). So we gave up visiting this nearby mountain. 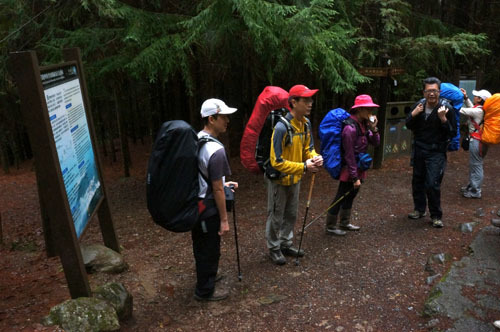 We returned to the very starting point (Point A, 登山口) at aound 3pm. Finally, we could get our body dry again.